All thunderstorms produce lightning. Lightning has been the second largest storm killer in the U.S. for the last 40 years, exceeded only by floods. If you hear thunder, lightning is close enough to harm you. Postpone outdoor activities promptly; don’t wait for rain. If you hear thunder -- even in the distance -- move to a safe place. Fully enclosed buildings are best. Sheds, picnic tables, tents and covered porches do not protect from lightning. If no safe buildings are nearby, get in a car (with a hard metal top) and close all the windows. Stay in shelter for at least 30 minutes after the last rumble of thunder. Stay away from trees and tall objects -- lightning generally hits the tallest object. If you are planning outdoor activities, know where to go for safety and how long it will take to get there. 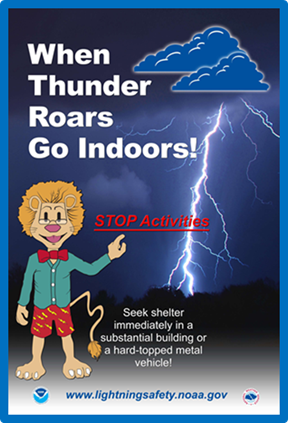 Consider moving activities inside if thunderstorms are predicted. Don't use a corded phone, computer or other electrical equipment while it's thundering and lightning, except in emergency. Cordless and cell phones are OK.
Don't use any plumbing fixtures during a thunderstorm since water pipes conduct electricity. Avoid contact with water, including showering and doing laundry. Avoid metal, such as golf clubs, fishing rods and tools. Move away from groups of people. Stay away from doors and windows, and stay off porches.